1. It is the largest slaughter of a marine mammal. 2. It is the only killing of nursing seal pups. 3. 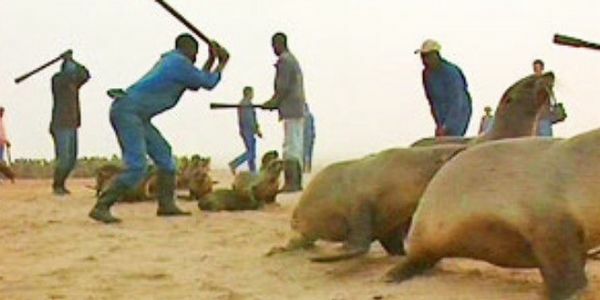 It is the only killing of seals in the Southern Hemisphere. 4. Cape fur seals are a Cites II-listed species. 5. It is done mostly within the Cape Cross Seal Reserve. 6. Beating animals to death is illegal in Namibia. 7. It is done by underpaid workers on behalf of Hatem Yavuz, the self-proclaimed "king of seal killers". We the undersigned demand that this cruel and illegal massacre is put to a stop forever. I still have not received a response from the office of the prime minister almost a week after I told her about the petition. I guess Namibia’s greatest natural treasure and world opinion doesn’t mean a thing. However, the government can not ignore us forever. We have 36,000 signatures from half of the countries in the world, including Namibia. We can get this slaughter stopped. We simply need to increase the pressure. For the oceans! I have emailed the prime minister to notify her of my petition. It has already received nearly 30,000 signers and thousands more support it every day. To all of you, thank you! This week I am going to try to contact some big names on social media and see if they can share. We will expose this dirty little secret to the world so that it is no longer a secret. For the oceans! With the petition growing close to 20,000 signatures, I thought I would share some news. While we raise awareness about the killing of seals in the Atlantic, this petition is also saving the seals in the Pacific. All of the butterfly rewards from your signatures go to feeding seals snacks at the Marine Mammal Center. Thanks for your continued support! Less than 3 days in and we are approaching 10,000 supporters. To continue the momentum, take the time to complete the following actions, please and thanks! 2. Support conservation groups like the Seals of Nam and Harpseals.org. I will be working on a boycott campaign and possibly a media campaign. For the oceans! 1,000 signatures in 24 hours! Thank you all so much, and please remember to share, share, share.